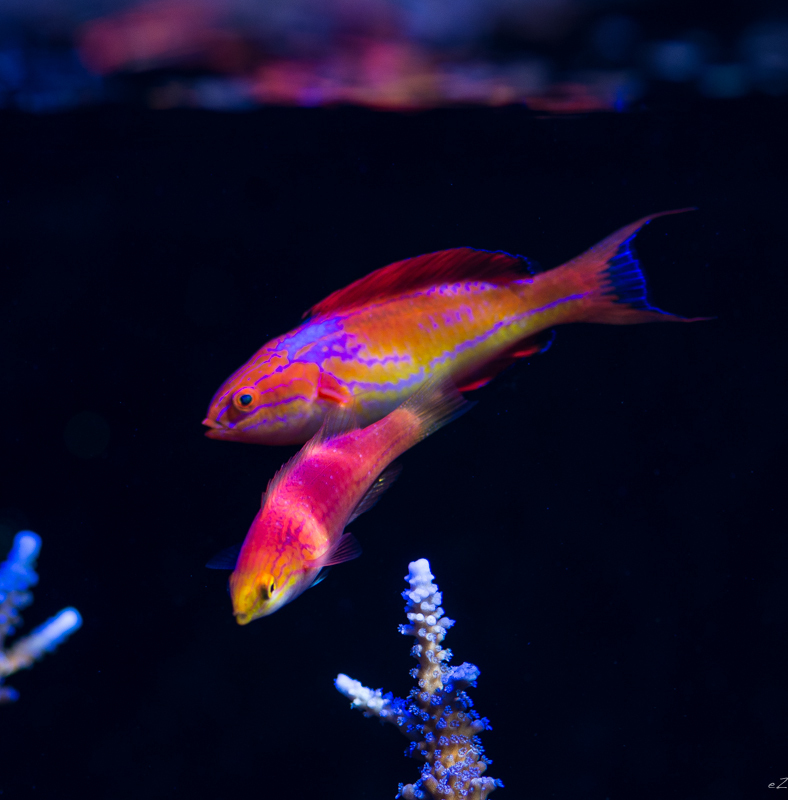 Last edition, we took a look at Cirrhilabrus lunatus. 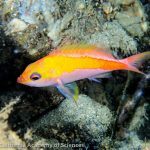 This month’s focus: Cirrhilabrus johnsoni; Johnson’s Fairy Wrasse. 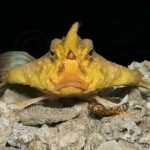 Johnsoni are something special, mainly because they are only found and known to exist in the Marshall Islands at the Kwajalein Atoll and nearby at the Bigej-Mack Reef. However, they have been reported in the surrounding areas as well. The underwater habitat at Kwajalein is massive, as it is one of the largest coral atolls in the world. 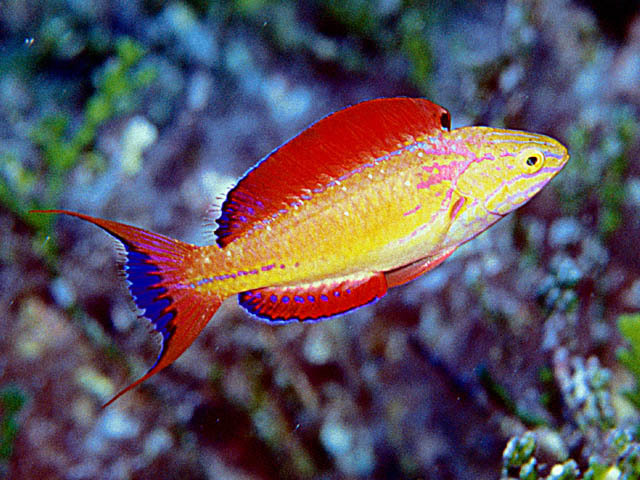 Cirrhilabrus johnsoni was named after a Kwajalein fish enthusiast and photographer from the 1970s and 1980s named Dave Johnson. He first found the species swimming over Halimeda patches on the lagoon slope. Here, this species feeds on zooplankton 1-2m off the seabed. It was officially described as a species in 1988 by none other than John Randall. 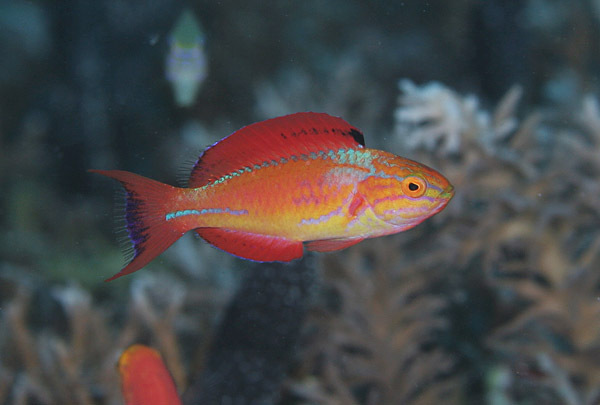 A smaller species than most for a fairy wrasse, C. johnsoni rarely exceed 3 inches, and they are generally collected at reasonable depths of 18-28m (60-90ft). As you may note in the photos above, there is a sharp contrast in appearance between male and female johnsoni. Females exhibit a very pink to peach body which transitions with subtle striations into the brightly colored yellow head. 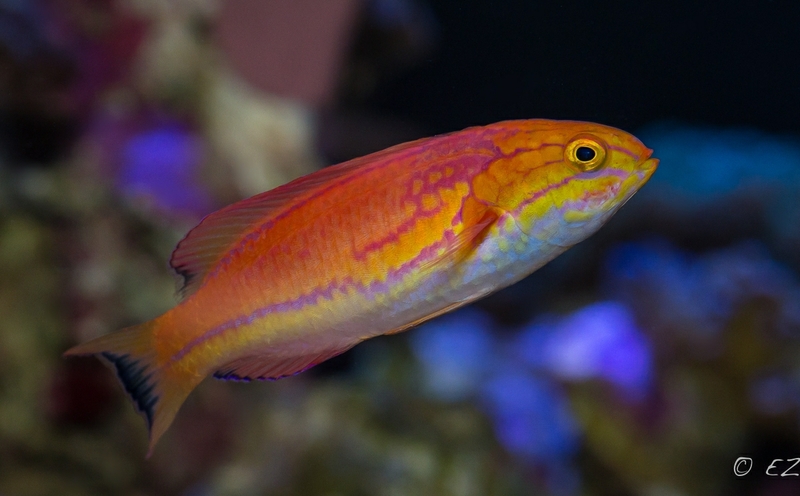 The fins remain mostly translucent with a hint of color, just like most other female Cirrhilabrus wrasses. However, males develop the striking colors you certainly can appreciate. 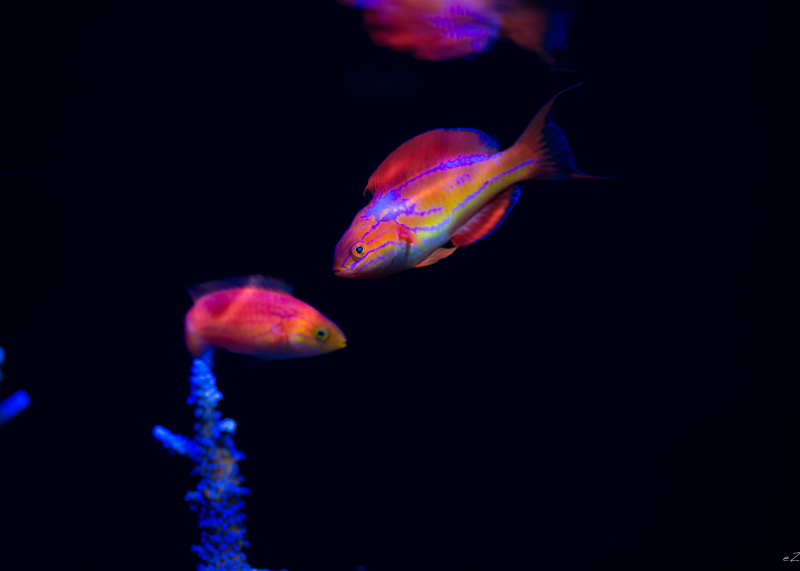 They display bright orange and yellow bodies outlined by fire engine red fins with blue highlights, all while painted by a few bright markings along the head and body. Male johnsoni embodies the stunning beauty of the Cirrhilabrus genus. 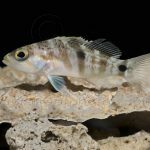 Johnsoni were becoming more frequent in the aquarium trade back in 2010, but have since tapered off into harder to obtain quantities. When available, male of this species generally fetch around 400 USD while females bring a respectable amount near 300 USD. This is a species I have the opportunity to own, keeping three in my home aquarium. 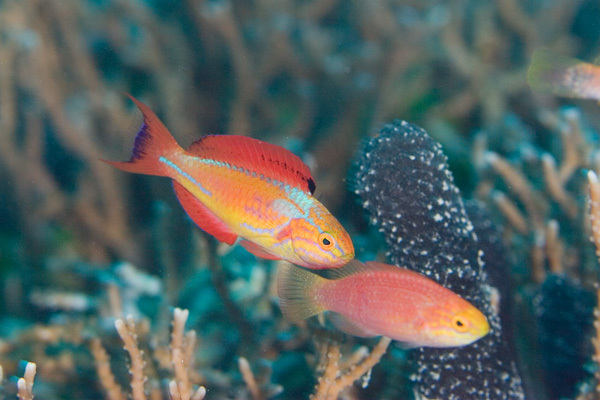 A male and female johnsoni on a wild reef. Photographer unknown. A male johnsoni on a wild reef. Photographer unknown. 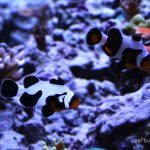 Hunter Hammond is a marine hobbyist who currently keeps a 190g reef in his living room featuring numerous rare wrasses. 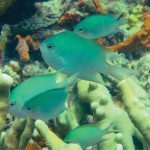 He strives to be a leading expert in the captive care of all reef-safe wrasses. He has been in the marine hobby since 2009 and lives in Phoenix, Arizona with his devoted partner. Hunter’s professional career is in the aerospace propulsion engine industry as a structures engineer.